inkyloulou Designs: Happy New Year- exciting times ahead. Can we really be well and truly into the first month of the new year already? I hope this year doesn't zoom past as fast as last year did- 2011 was gone in the blink of an eye. I wish all of you lovely people that visit my blog a wonderfully happy, healthy and successful year ahead. In a couple of weeks my little Elliot (who seems to be growing up more every day) starts 3yo kindy twice a week for a couple of hours. This is his first adventure on his own away from home so is very exciting and also a bit emotional for Mummy. I am also contemplating a return to the long forgotten part of my life which is work as a nurse/midwife- very, very part-time but returning to work all the same- eeeeep! Much excitement is also ahead in my crafty world. I'm looking forward to really working hard towards achieving my goals for my little business this year- with more workshops, classes, creating, selling, challenges and blog posts. There is no better way to get the new stamping year started with fun and excitement than with SALE-A-BRATION which starts on January 24th. If you haven't been around for a Sale-A-Bration before in a nutshell it is a 2 and a bit month festival of gorgeous FREEBIES. Wooooo hoooooo!!!!! There will be more details on it all next week. I am also participating in a Sale-A-Bration blog hop amongst Australian & New Zealand SU Demonstrators so make sure you pop back here next Tuesday to have a look at my creations and then hop through all the other demo's blogs too. I can't leave you without a sneak peek of some of the gorgeous Sale-A-Bration products though can I? Here are some invitations that I made using the 'Everyday Enchantment' designer series paper and Fresh Vintage stamp set (both available for FREE during Sale-A-Bration). These invites are CASEs of the card my lovely friend & upline, Sarah Klass, had us make at our team day gathering last weekend. These invites are to my very special Sale-A-Bration evening that I am hosting on Feburary 9th. If you are in Perth and would like to come along please contact me and I will pop one of these invites in the post. I couldn't say goodbye today without allowing this new little friend of mine to say hello. After seeing some gorgeous little fabric owls around blogland I decided I just HAD to make my own. I have not had much experience with sewing but with my new sewing machine (thanks Mum) and some beautiful Spice Cake Designer Fabric (from the current Summer Mini catalogue) I set about making this little 'Hooty'. The pattern for this little owl came from Toad's Treasures- a fantastic, easy pattern that even novices like me can follow. I have to say he turned out just a bit cute. 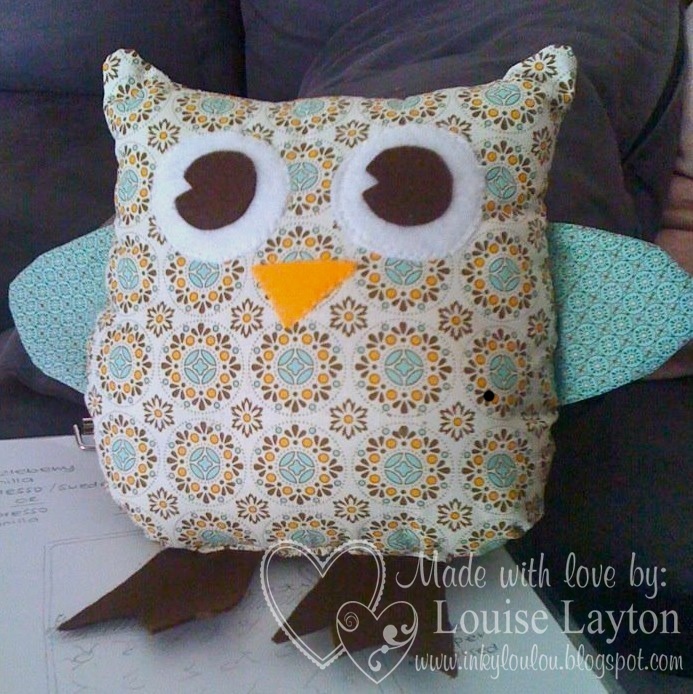 I may just have to make him a little 'Hooty' girl friend out of the pretty Flirtacious fabric too. Well I hope you all have a lovely day and weekend. I will see you back here next Tuesday for some Sale-A-Bration blog-hopping fun.